In a short amount of time Raspberry Pi archived a very high acceptation and recognition amongst the enthusiasts than any other device. Lunched in February 2012 and just cost between 25 and 35 US $. Raspberry Pi based on 700 MHz ARM processor and current version comes with 512 MB of memory. On the OS side many it support many Linux kernel based operating systems and some of them released their slim-down versions for optimal performance. With support of native USB and adequate number of I/O’s, Raspberry Pi is ideal for hobbyist to professional projects such as old Game console emulators. Lot of the supported Linux already have many different games emulators that can be used to play games but they all comes with their own issues and setup complexity which takes out the fun element. 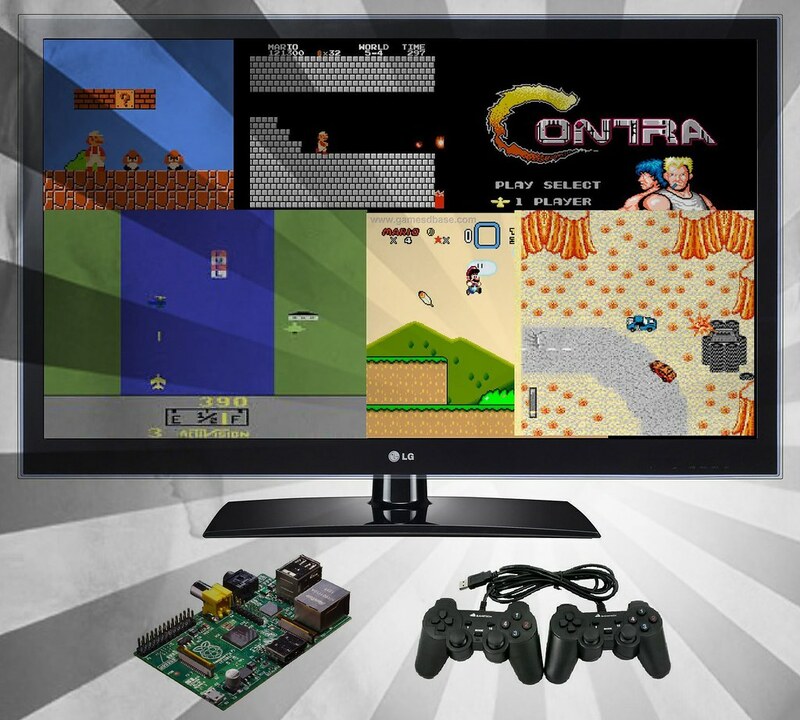 And here’s comes RetroPie Project () which bring all of the best of retro gaming is one small package. RetroPie comes in two flavors, RetroPie Script and RetroPie SD-card image. RetroPie Script is a bash script which let you install and configure all the emulators and components but it require that Raspbian OS is already installed on the Raspberry Pi. While RetroPie SD-card image is complete and prepared image of Raspbian OS, all emulators, front-end and Samba shares ready to start and play. We need following hardware components to build. I will be using Windows OS for this part of the setup, depending on your OS steps can be slightly different. First thing first, we need to get the latest (current v2.3) RetroPie SD-card image from the here. Download image is compress in Zip, extract it by using 7-zip or other compatible utility. In some TV/monitor displays Raspberry Pi HDMI don’t show anything (No Signal). This is a known issue, and can be fixed. Unplug the SD card from window machine and hock it up into Raspberry Pi and attach all the cables including USB game Pads and turn on the system. Raspberry Pi will automatically turn on when USB power cable is connected. In a short while a controller input configuration screen will be prompted, this input configuration is only for emulators Front-end navigation and an additional setting will be needed to configure In-Game controller setup. In most cases RetroPie automatically detect the controller and prompt you the press the correspondent buttons. To get better performance we need to change some configuration in Raspberry Pi underlying OS. Press F4 on the keyboard and it will take you out from Emulator front-end to Raspbian command shell. Enter “raspi-config” command and it will prompt a configuration screen. After that select Option 8 and enable SSH and SAMBA, it will enable remote connection from another PC (through putty) and file sharing to transfer ROM files. Also select “Memory Split” and change the memory allocation to 128 for 256 MB Raspberry Pi and 256 for 512 MB. Finally navigate down to Finish by using TAB and press Enter to confirm. It will restart the Raspberry Pi. Go the command shall by pressing F4. Use the following command to configure the Gametech twin USB controller by default only one of the twin will work. -j indicate the joystick index while –p indicate the player. Try -p2 in -p 2 does not work. Following command will add the functionality of load and save states for the games. Now add L and R paddle to load and save those states. Write . emulationstation command to start up the emulator again from the shell. In 2.3 version of RetroPie SD-card image SAMAB is already setup for many individual emulators, thus transferring game in much simpler than previous versions. You need to connect your Raspberry Pi to your network and SAMBA shares will appears on your Windows Network shares, there you can transfer your ROMS to the relevant Share Directory. When transferring is done go back to your Raspberry Pi and on the emulator screen you see the transfer games. Now Press the START button and begin you Classic Mario or River Raid adventure ….